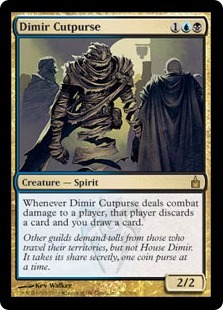 Oracle tekst Whenever Dimir Cutpurse deals combat damage to a player, that player discards a card and you draw a card. Flavortekst Other guilds demand tolls from those who travel their territories, but not House Dimir. It takes its share secretly, one coin purse at a time. Om te reageren op Dimir Cutpurse dien je eerst in te loggen.